Rhode Island part-time care providers know it’s important to make sure your older loved one stays warm during the winter months. It’s also important to tune into other winter health risks that your loved one may face. Read on to learn more about how you can keep your loved one safe this season. Shovel your loved one’s driveways and sidewalks, or hire someone else to do so. Encourage your loved one to avoid icy and snow-packed walkways. Purchase your loved one boots with non-skid soles to reduce the risk of slipping on wet or icy pavement. If your loved one has a fireplace, make sure the chimney is cleaned and inspected annually. Place smoke detectors on each story of the home and change the batteries twice a year. Ensure that space heaters are placed at least three feet away from flammable objects like drapes, loose paper, or bedding. Shoveling snow in cold air places an unnecessary amount of strain on the heart. Arrange for someone else such as a Rhode Island home care provider to shovel your loved one’s driveway and sidewalks. This will reduce your loved one’s risk of heart attack in addition to seasonal illnesses like cold and flu. Before winter sets in, have the antifreeze, tires, and windshield wipers on your loved one’s car checked and replaced if necessary. Make sure your loved one always carries a cell phone so that he or she can call for help if stranded. Finally, ensure your loved one’s house is stocked with food and other supplies to eliminate the need for driving in bad weather. Vitamin D deficiencies can lead to weak, vulnerable bones. Since people get most of their vitamin D from sunlight, encourage your loved one to get outside on mild, sunny days. Your loved one may also want to consider taking a vitamin D supplement during the winter months. 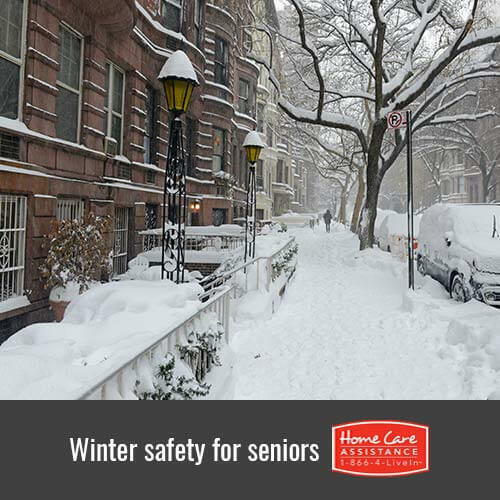 Seniors can face several health and safety challenges during the winter months. Your awareness of these issues and compassionate intervention can help keep your loved one safe. To help your loved one stay safe this winter, turn to Home Care Assistance of Rhode Island. We are a leading provider of Parkinson’s, stroke, dementia, and Rhode Island Alzheimer’s care that promotes senior safety, health, and wellbeing. Contact us today at (401) 284-0979 and schedule a free consultation with a friendly Care Manager.